The Troy baseball team stretched its winning streak to seven games on Tuesday, April 2 with a 10-3 victory over visiting Alabama State. The Hornets were stung by the Trojans’ timely hitting with runners on base in a game that got out of hand for ASU in the bottom of the 4th inning. 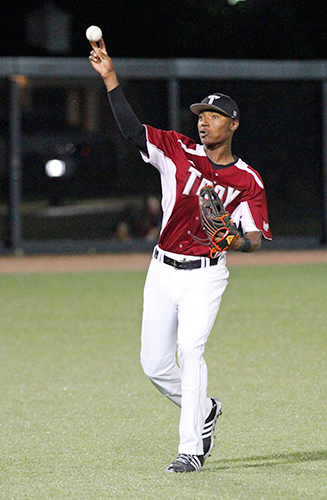 Troy left fielder Jo-El Bennett was clutch when he stepped into box with Jakob Nixon standing at second having just doubled to lead off the inning. Bennett gave the Trojans the lead with a RBI triple deep to the left center gap that scored Nixon to make the score 3-2 Troy. “Well I just wanted to come out here and relax and play the best game that I could,” Bennett said. Two RBI singles later the Trojans were up 5-2 on the reeling Hornets with two outs in the bottom of the 4th. The Trojan first baseman Trae Santos poured salt in Alabama State’s wound when he smacked the ball for a two run triple to make it a definitive 7-2 advantage for Troy. By the end of the 4th, yes the Trojans did look to be on the same page but earlier on a Troy team that had already lost 4-3 to Alabama State on the road back in February was looking far from it. The Hornets got after Trojan starting pitcher Ryan Sorce, scoring two runs on the lefty in the first two innings. But Sorce was able to hold the Hornets at bay from then on as he pitched five innings allowing just three hits and those two early runs. “They put the ball in play well so you have got to give credit to the defense,” Sorce said. Troy tied the game up 2-2 in the bottom of the 3rd inning off of two Alabama State errors. The Trojan bullpen of Austin Sullivan, William Teal, Thomas Austin and Jeremy McGowan each pitched one inning, not allowing any hits against the Hornets. The Troy right hander Austin struggled in the top of the 8th, allowing Alabama State to cash in one run to make it 9-3 Troy but a Santos sac fly in the bottom half of the inning to make it 10-3 killed any hope for a Hornet rally. The Trojans look to keep the streak going when they hit the road to face Louisiana-Lafayette in a three-game weekend series starting on Friday, April 5 at 6 p.m.